However, wages undershot forecasts before the crisis (Saunders, 2017), and alternative reasons have been advanced for slow wage growth: developments in labour supply, which may have lowered the natural rate of unemployment, or low headline inflation. A careful analysis of the sectoral data suggests that the relationship between productivity and wages is not simple, and that causality may run in both directions. The slowdown in productivity performance has been uneven across sectors (a recent BU post offers readers an interactive tool that can be used to explore sectoral productivity trends). A number of sectors, such as agriculture and construction, have actually seen productivity growth accelerate. Can the dispersion of productivity performance across industries tell us anything about the link between productivity and wages? Economic theory argues that the marginal product of labour is the most important determinant, in the long-run, of wages. Average output per worker is only an imperfect guide to marginal product, but over the very long term, aggregate productivity and wages have indeed moved closely together (Haldane, 2015). However, perhaps surprisingly, economic theory does not necessarily predict a strong link between productivity in any particular industry and wages in that industry. If labour can move freely between sectors, then productivity growth in one particular industry will result in slightly higher wages for the workforce in general, not just workers in that industry. What matters for wages is the outside option for workers – which in turn is determined by productivity in the economy as a whole. In reality, moving between sectors can involve time, money and taking a risk. Furthermore, the picture is complicated because productivity changes can be ‘passed forward’ into prices as well as ‘passed backwards’ into wages. To investigate the link between wages and productivity empirically, ONS data on sectoral output can be combined with data on sectoral wages and employment from the Average Weekly Earnings (AWE) survey. Together, these data give a picture of the joint behaviour of productivity and wages across 24 industries in the economy. This level of disaggregation is more detailed than the 16 industry split published in the Quarterly National Accounts (QNA); manufacturing is split into 6 industries, whilst on the service side, wholesale and retail are separated, as is transport from communications. Data quality at lower levels of aggregation is likely to be slightly worse; however the results are similar using the smaller set of industries defined in the QNA. The AWE employment data do not include self-employment, which will bias the calculations of productivity slightly for some industries in which self-employment is important. This is likely to be more of an issue for the level of productivity than the growth rate. Do industries with high productivity also have high wages? Yes. Figure 1 shows the correlation across industries between log real output per worker and log average real wages. 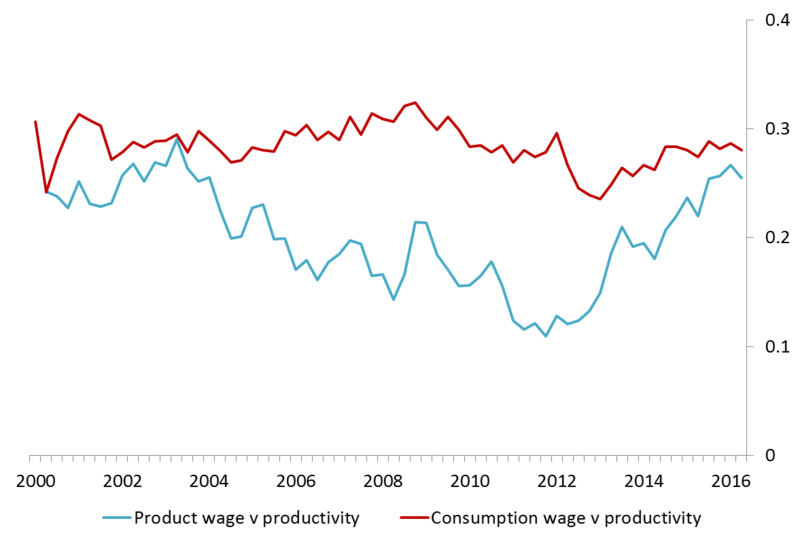 The red line shows the correlation between real productivity and real consumption wages (RCW). Real consumption wages are nominal wages from AWE deflated by the aggregate CPI; they try to measure what a wage is worth in terms of the goods and services it can purchase. 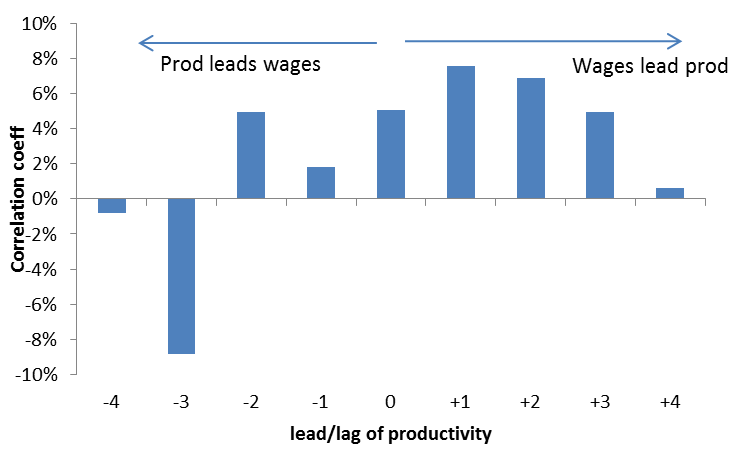 The blue line shows the correlation of productivity with real product wages (RPW). RPW are nominal wages deflated by the price deflator for that industry, and try to measure the cost of labour to the firm in terms of the goods or services the firm produces. The correlation between productivity and wages has been positive at all times for both measures. Source: ONS, author’s calculations. Excludes manufacture of textiles, leather and clothing; for this industry, the deflator increases very sharply (by around 40%) over 2012 and 2013, abruptly increasing the RPW-productivity correlation. Given the problems with the measurement of clothing and footwear prices this is likely to be at least partly spurious. Do industries with higher productivity growth have higher wage growth? Productivity growth can vary considerably across industries. Even excluding mining and extraction (the industry with the most volatile productivity by far), the cross-sectional standard deviation of annual growth averages around 6 percentage points although it has been trending downwards. At any one time, productivity can be growing fast in one industry whilst stagnating (or contracting) in another. Do these industry-specific variations in productivity growth feed through into real wage growth? That depends on the measure. As the blue line in Figure 2 shows, there is little or no reliable correlation between growth in productivity and RCW (the chart shows the correlation for annual growth rates, but the results are similar using higher or lower frequency measures). 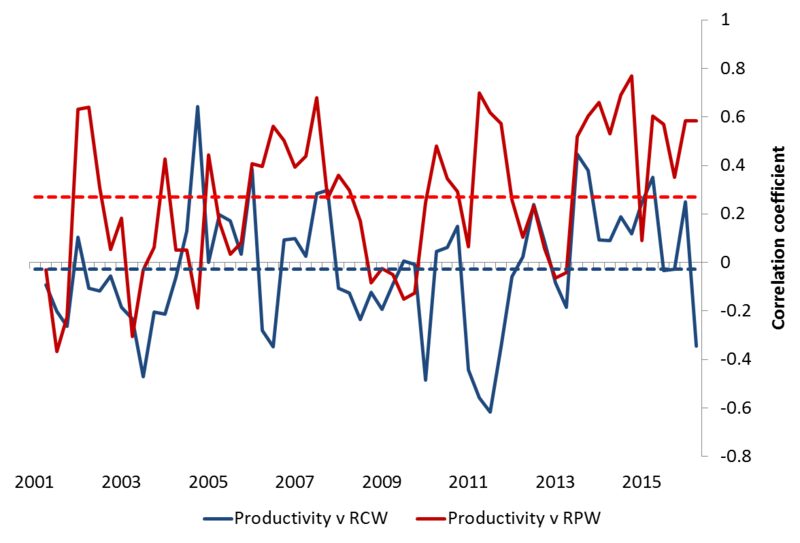 There is a much better industry-level correlation between growth in productivity and RPW (the red line in Figure 2). Although not stable, the correlation is positive in most periods and averages 0.25. The beta in a cross-sectional regression of productivity on RPW has averaged about 0.33; that is, a 1% increase in productivity growth is associated with an increase in RPW of around 0.3%. The value of this coefficient has been trending up over time. Source: ONS, author’s calculations. Excludes manufacture of textiles, leather and clothing. RPW growth is also better correlated with productivity growth at an aggregate level. That suggests that RCW growth is moved around by factors other than productivity – for instance, movements in the exchange rate that affect retail prices – and so points to a limited role for ‘real wage resistance’ (the idea that increases in living costs from higher import prices will lead workers to bid up nominal wages to support the real value of their earnings). The cross-sectional evidence supports the idea that it is output prices, not retail prices, which matter for wages. These correlations may also tell us something about how an increase in productivity in a particular industry feeds through into real wages. Rather than bidding up relative nominal wages (and therefore, the relative RCW in that industry), an increase in productivity leads to lower relative prices for the output of that industry, increasing RPW for given nominal wage. This boosts the real consumption wages of workers in all industries. The benefits of productivity gains are diffuse; the costs, of course, may not be, if productivity gains lead to lost employment in that industry. Does productivity growth help predict wage growth at an industry level? Not really, no. The distribution of productivity growth across industries is positively correlated with subsequent wage growth – industries with higher productivity growth now will tend to have higher wage growth in subsequent quarters. However, productivity growth has little additional value in predicting wage growth over and above univariate models. Figure 3 shows the results from correlating industry level productivity shocks with wage ‘shocks’ (defined as the residuals from a univariate regression, with lag-structure chosen to optimise information criteria). The link between where an industry is in the current distribution of productivity growth and where it will be in the future distribution of wage growth is not very reliable. If anything, it is relative wage growth that tends to lead relative productivity growth. Average correlation from 2000Q1-16Q3 for each lead/lag combination, between shocks to productivity and to wages. Shocks are estimated as the residuals from a univariate regression, with lags chosen to optimise information criteria. Looking at each industry in turn, Granger causality tests do not find a clear role for productivity growth in predicting wage growth. As shown in Figure 4, productivity growth Granger causes wage growth for only a minority of industries. Wages Granger-cause productivity for a larger group of industries, although still fewer than half. P-values: averages across industries for the test of whether lags of productivity (wages) have a joint coefficient of zero when added to a regression of wages (productivity) with lags of dependent variable. Proportions show share of industries with p-values below 10% (5%); e.g. 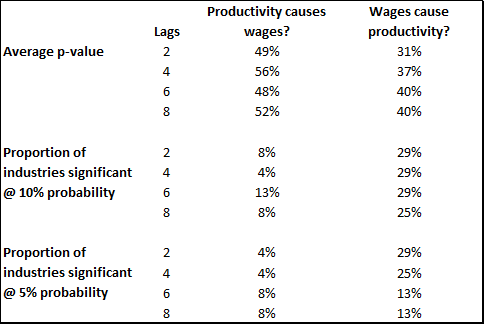 using 6 lags, we can reject the null hypothesis that wages do not Granger cause productivity for 29% of industries. Together, both cross-sectional and within industry time-series evidence are consistent with a two-way relationship between wages and productivity. There may be shocks from labour supply – or developments in other industries – which first affect wages, leading industries to adapt (for instance, change capital intensity) in a way that changes productivity. Alternatively, shocks to the demand for an industry’s output could initially move wages, followed by a productivity response. Rather than a simple and clean link from productivity to wages, the industry level data point to a richer and more multi-directional relationship between productivity and wages. Productivity growth is linked to wages, but the relationship may go both ways, and the link between productivity and real wages may operate through prices as much as nominal wages. 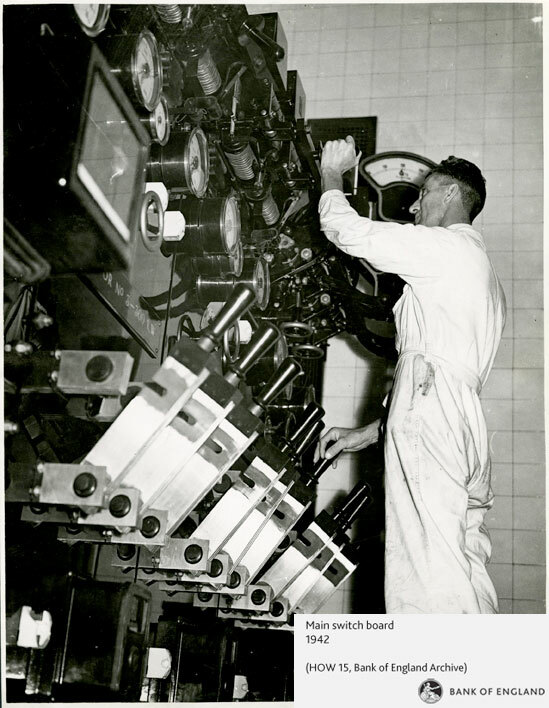 Alex Tuckett works the Banks external MPC unit.